Thanks to 2018’s smash hit Daddy Cool <逆緣>, Carlos Chan (陳家樂) is no longer stuck in ice. In 2003, when Carlos was 17 years old, he won the New Talent Singing Championship hosted by EEG, and was subsequently signed by the label. Despite having a major record deal as his backing, Carlos’ singing career never took flight. For the next few years, Carlos shot commercials and made guest appearances in music videos by EEG artists, such as Twins and Ken Hung (洪卓立). He appeared in EEG films and had his first major television role in TVB’s Dressage to Win <盛裝舞步愛作戰>, but his career eventually fell flat again. 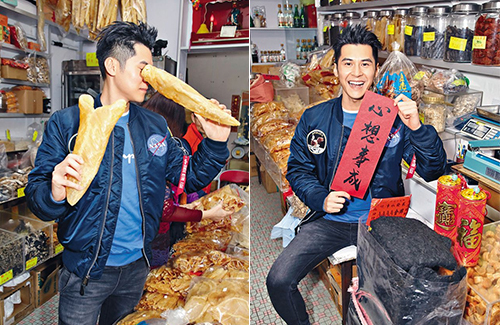 It wasn’t until 2018’s Daddy Cool, ten years after his first TVB drama appearance, when Carlos finally found a reason to stay in the industry. His role as Chung Ting-kwok—a 1940’s soldier who was frozen in time but revived in present-day 2018—was widely praised, and Carlos became an overnight sensation. When the series ended, new movies and dramas were already lined up for Carlos to film. He became a hot favorite for endorsers, becoming one of 2018’s highest-earning celebrity stars. He earned back all ten years in one year. At the time of the interview, it was not yet Lunar New Year. Although busy with work, Carlos told reporters that he hopes to go back home for the New Year’s to spend with family. 2019 will continue to be a busy year ahead for Carlos. After Daddy Cool, Carlos worked on six other films including the upcoming TVB drama ICAC Investigators 2019 <廉政行動2019>. “I hope in 2019, everyone will continue to pay attention to my performances,” he said. And while Carlos would like to be able to take part in more quality projects, his ultimate dream is to become a director.